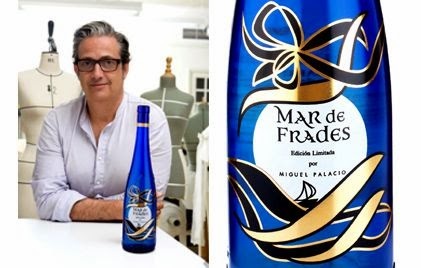 Laura Ponte, Creative Director of the jewelry brand Luby & Lemerald, He has designed a beautiful bottle -in limited edition-, with the sea as a source of inspiration for the wineries of Mar de Frades. These wineries are a foot of vineyard estate Valiñas, on the slope of a Mount (in the Centre of the Salnes Valley) to the ría de Arosa, where to get the Brisas the Atlantic tempered by the estuary, which permeate the vines of grapes of a characteristic touch saline that makes them unique. That same Atlantic, that inspired both the Galician designer to create your collection Nautilus, It has been reproduced in the bottles through an elegant and avant-garde design, geometric and conceptual where, in addition to the waves and of the seagulls -as part of the DNA of the House-, see screen-printed gold abstract tentacles of an octopus in the purest style Op Art, with a few very marked chromatic contrasts (the cobalt blue bottle with gold and black), and the use of simple geometric figures like circles. My new collection Nautilus y Mar de Frades they have the same essence, the ocean Atlantic. The marine environment that has inspired me is linked in some way to the wine because both are in a very special part of the North of Spain, where the sea has great strength. The colors and shape of the bottle they go on our pieces, delicate line and back with a great work”. These bottles kept inside the new vintage 2011 wine Albariño intense yellow color with persistent notes floral and clear traits of fruit seed as the Fuji Apple or pear. In mouth, the freshness is persistent with similar feelings to the perceived in nose with a Fund of infusion Herb (camomile, tea of rock) and with memory saline, so characteristic of this wine, which we mentioned at the beginning. 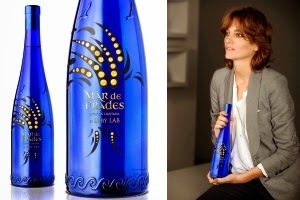 The Mar de Frades de Laura Ponte, now in a bottle collector. A bet by the quality a product that is burnished by the character and the rigour of the Galician climate. And, we mean both the continent and content!